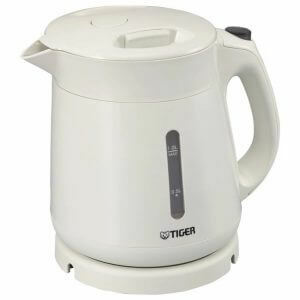 Whether you’re drinking coffee or making instant noodles, it is always convenient to have an electric kettle around. There are a lot of available products from different brands such as t-fal, Imarflex, Philips and Micromatic, with different types too such as those with thermal features or those that are stainless. There are also fashionable electric kettles available. 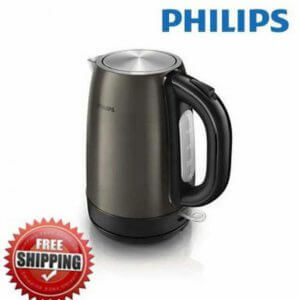 We will show you the pointers in choosing the best electric kettle for you and show you the top items available online in rank order. After the ranking, we will also compare the prices of gas and electricity to help you save financially! Hope you could find your favorite electric kettle that can also help you save some electricity! Once you’ve experienced how convenient electric kettles could be, giving you just the amount of hot water you need, you won’t be able to let it go. You might use an electric kettle for few times a day. What are the things you should keep in mind when choosing? First, think about when you’re going to use it. How much hot water do you need? Approximately, one cup of coffee needs 140㎖, one cup noodle needs around 300~500㎖ of hot water. You can boil a pasta with around 1ℓ too. If the size is too small, you need to heat water multiple times and that can be troublesome. If the size is too big, it might consume too much unnecessary electricity. Think about the amount you will usually need, and choose the best size for you. Electric kettles have a wide variety of products from those that can contain below 500㎖, to those with 1.5ℓ capacity, but there are no products with more than 2ℓ capacity. If you need more than 2ℓ, you might want to consider purchasing an “electric air pot”. If you live alone this might not be that important, but if you have kids, this feature will become extremely important. 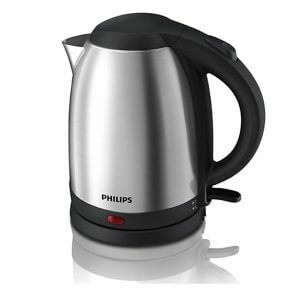 Unlike the non-electric kettle that you use with your gas stove, electric kettles can be brought to the dining area. That is why you need to check the kettle’s body temperature when boiling and its steam. You might mistakenly use it like a thermos, but keep in mind that it is a kettle. A lot of products are developed for safer use. For families with little children, we recommend choosing electric kettles with 2 layer-structure to keep the body temperature low, and those with a steam-less feature. Those made with polypropylene can also keep the kettle body cool, while stainless type has a higher tendency of raising its temperature while boiling. There are electric kettles with a spill-proof feature that can save you when you accidentally topple your electric kettle. 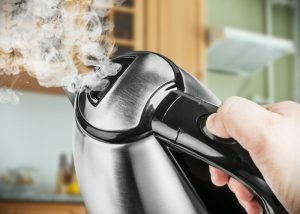 A lot of accidents are caused by toppled electric kettles. Kids sometimes imitate their parents and try to pour the hot water and that can cause burns. Its convenience can make you a bit careless and keep it somewhere within your reach. Big accidents can happen when little kids are around even if the water is not freshly boiled, so be sure to check this feature out! Though electric kettles with this feature usually have a safety lock that you need to unlock before pouring out hot water. If you leave alone or you’re all grown ups in your household, then this can be a bit troublesome. This feature is more common with Japanese brands. If safety is your top priority, it may be a good idea to focus more on Japanese brands. You thought there is still a water left inside the kettle and you turn on the switch but the kettle was empty… that is a pretty common scenario. Not noticing that there is no water inside the kettle, since naturally it won’t make the sound that it should make when boiling water, can lead to kettle breakage or fire. This feature will take away the “oh no, did I use the kettle this morning?” moments! Is Boiling Speed an Important Factor? 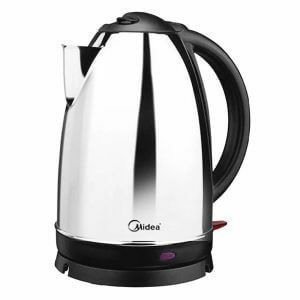 Electric kettles use electricity in heating the water. The power consumption of the product will change its boiling speed, but there is no big difference. Basically, 1 cup (140㎖) of water takes 60 seconds to boil, and fast products will take 45 seconds. 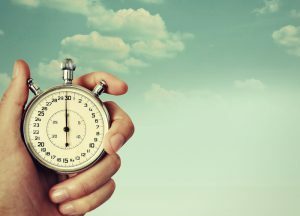 There may be people who think that a 15 second difference is a big deal, but it may not be that important. 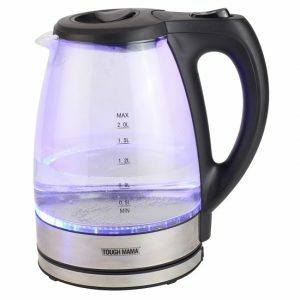 There are some electric kettles that can keep your water warm for a short period of time. This feature is useful when your family tends to use hot water at different times during a meal, or if you tend to use hot water more than once in a short period of time. It can prevent you from multiple reheating, that can result to cheaper electricity bills. 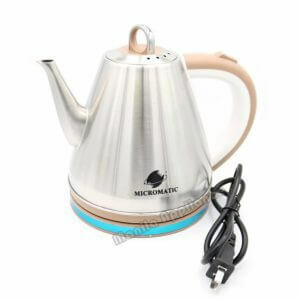 There might be some people who are thinking “why are there electric kettles without heat insulation?” Please remember that the main purpose of an electric kettle is to boil water without the use of fire, with comparatively affordable prices. Heat insulation is basically not a feature of an electric kettle. When you want to make milk for your baby, or depending on the tea you want to drink, there are times that you want a hot water, but not boiling water (100℃). In that case, choose an electric kettle with temperature control feature. There are those with fixed temperature options such as “60℃, 80℃, or 100℃”, or those kettles that you can set the temperature. There is not much difference between the 2, you may opt whichever you find is best for you. There are different spout shapes for different reasons. They have different safety levels and feeling of use, so try to look into them more closely. 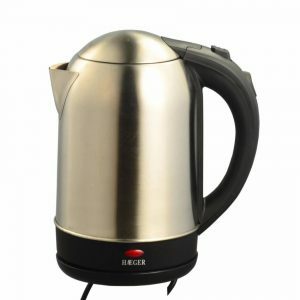 The most common spout shape for electric kettles is the triangle type. The spout is located at the top part of the kettle requiring you to tilt the kettle at a lower angle before you can actually pour hot water. This can be troublesome for some people, but this is the safest spout shape. Locating the spout at the top part means hot water won’t easily spill when you accidentally topple the kettle. Also, it won’t take up too much space when you store it. Coffee Pot Type or Kettle Type for Meticulous Ones! The best way to make delicious coffee is to pour in hot water very slowly and thinly. 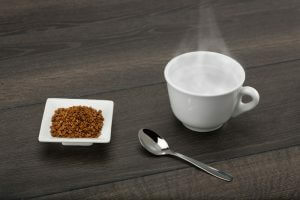 If your main purpose is to make delicious drip coffee, the coffee pot type with slim spout is highly recommended. 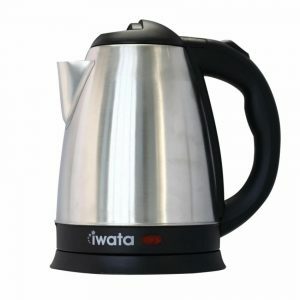 There is also kettle type that resemblance the non-electric kettle that you are used to! 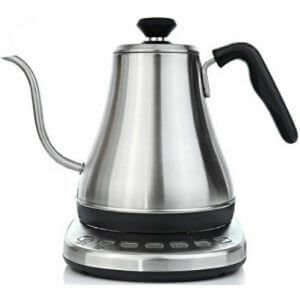 Coffee pot type or kettle type comes with a retro design that is very fashionable. Choosing becomes so much fun with so many cute designs, right? Do not forget to check if the cord length is long enough for you. Not just the mere length, be sure to check if the cord won’t be a hindrance in storing your electric kettle compactly, if you can wrap them up neatly, etc. Make sure to choose the product that won’t stress you out with its cord. Some products have bad cord placement that puts the kettle’s stability at risk. You can check the product description or read their reviews. We will now move on to the top products available online. Hope this can help you out! 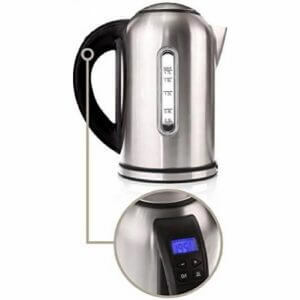 This electric kettle is one of the most affordable products available in the market with all the basic features, and from a reliable brand. It has a power indicator light to notify you when the boiling has started or ended. It also has automatic shut off when the boiling is over, and anti-dry burning. 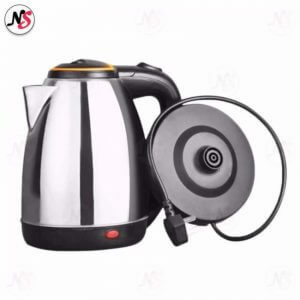 This electric kettle is highly recommended for those who are looking for an affordable product that can be stored neatly when not in use. One downside about this product is it can be a little noisy when boiling water compared to other electric kettles. 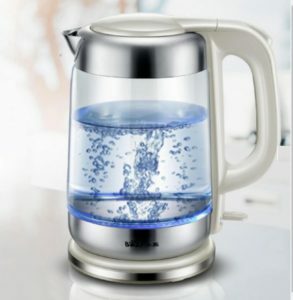 This electric kettle has a glass body so you can clearly see the water level. Neat freaks also love this product as it is very easy to keep it clean with its see-through glass body. It also has an LED light that illuminates the water while it boils that can keep you entertained while you wait for the water to boil. Since the kettle’s body is made of fragile material, we cannot recommend this to families with children. The best part about this electric kettle is that comes with a high-quality thermostat to know the water temperature. Perfect for big families with the time difference in using hot water during breakfast. Some users also mentioned that this product is perfect for office use because of its thermostat feature. It also has a hassle-free cord storage under its base for more organized storage. This electric kettle is shaped like the old school kettle we’re all used to, that matches perfectly the ambiance of an afternoon tea or relaxing coffee time that you can bring it safely to your table because of its heat-resistant body. It has a convenient cord storage under its base, though storing it might take up a bit space because of its shape that can be inconvenient for those with limited storage space. This electric kettle has a one-touch dispense lock button that is perfect for families with little children. It also has a double wall structure to make sure its body won’t heat up after boiling. Though it has a lesser capacity than the other kettles (1ℓ), it is still good enough for a small family. 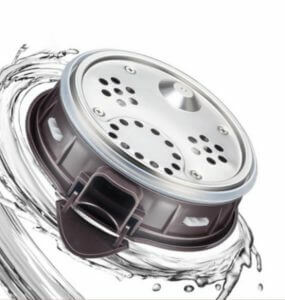 This product has a wide opening for easier cleaning and water refilling. It comes with an easy-to-use thermostat for temperature control and monitoring that can be useful when making milk or baby food for your kids! This electric kettle is one of the few products that has a capacity of more than 2ℓ, perfect for big families that are not so uncommon in the Filipino household. You can boil all the water you need at one time! Reviews also commended its durability despite its cheap price! 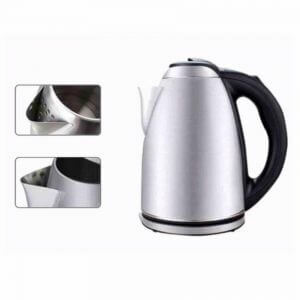 This electric kettle is made of rustproof stainless steel for safety and durability. This product aims for a long-term use and even has a 2 year worldwide guarantee! It has a UK designed temperature control for a wider range of product use for whole family’s use. It also has a flat heating element for easier cleaning and faster heating to help you out with your busy morning. It will still depend on the brand of your electric kettle, but basically, electric kettles use around ₱1.25 for boiling 1ℓ of water (source: Meralco AppCal). If you use them three times a day, then your monthly usage will be at around ₱112.50. Boiling 1ℓ of water using a gas stove will take around ₱2.65 (computation based on 11 kg LPG priced at ₱700). 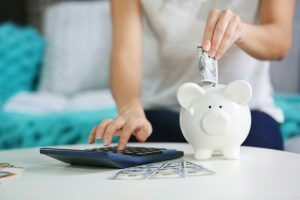 Electric and gas prices change from time to time, so there is no definite number to compare the utility consumption, but we can still safely say that boiling water using electric kettle will be more cost efficient. Keeping a hot water in an electric air pot will cost you more than 3 times the price of using an electric kettle (around ₱390). Unless you’ll be needing hot water from time to time, it might be wiser to just boil water every time you need it. How was the electric kettle ranking? A lot of brands have their own electric kettles. They all have their own strengths and all of them are very useful products. Some with good designs are pretty to look at too and can become a part of your interior. Hope you can find the electric kettle that is perfect for your lifestyle and enjoy a relaxing tea time!